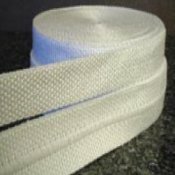 FlameShieldä InSilMaxä is an extreme high temperature, heat and flame resistant silica tape, and is an excellent alternative to asbestos and ceramic based textiles. 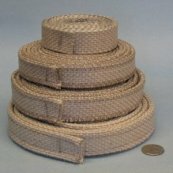 This high temperature tape can be used to wrap and protect wires, cables, hoses, pipes and tubes, and also provides energy savings and personnel protection. · Highly flexible and minimal shrinkage. · High abrasion resistance and tensile strength. · Melts above 3000°F / 1648°C. · Available with (PSA) pressure sensitive adhesive on one side. · Manufactured from roll fabric. · 1", 1 1/4", 1 1/2", 2", 2 1/2", 3", 4", 5" and 6" widths. 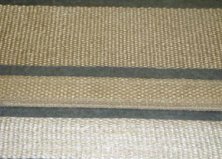 · Other widths available by request. · Manufactured by layering 0.090" tape. 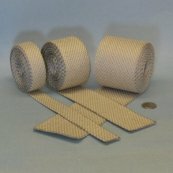 · 2 layers for 1/8"; 3 layers for 3/16" and 4 layers for 1/4"
· Standard 25 and 50 foot rolls. · Easy to wrap around radius without buckling, edge is salvaged. · 1", 1 1/2", 2", 3", & 4" widths.